This weeks Tool Review is going to be a little different and super short! But don’t worry, I do have an Easter project to share as well. This week, I’m reviewing a product that just came out in the Occasions Catalog – Wink of Stella. The price for the Wink of Stella is $8 (a little less if you’re a Stampin Up Demonstrator). The description in the Catalog says “glitter pen for accenting stamped images”. It comes in both Clear and Gold. Here is the five criteria I use when considering purchasing a new tool. How big is the learning curve? Not a huge learning curve once you figure out how to get it going. Do I already have something else I’m currently using that does the job? There are other products on the market that can add a glitter coating. Does this tool add (potentially unneeded) extra steps to getting my project completed? No. How much does it cost? Price is reasonable. Although from what I hear it comes in a bunch of different colors, which can add up if you buy one of each. Stampin Up sells just the Clear and Gold. Do I even know what it’s for? Yep! It adds a nice glittery look to your project. Did you notice in the picture above, the Wink on the left has a black band around it? This means that the Wink is still “sealed”. You unscrew where the black band is, remove the band, and the screw the cap back on. Gently squeeze the tip. Don’t keep squeezing it though or you’ll end up with a nice big blob all over whatever you’re working on. This is a sample of how it looks. The rose on the left is plain. The middle one has Clear Wink and the one on the right has Gold Wink. Unfortunately, the Clear Wink doesn’t photograph very well, but it is there and it looks beautiful in person. On to my Easter Project! 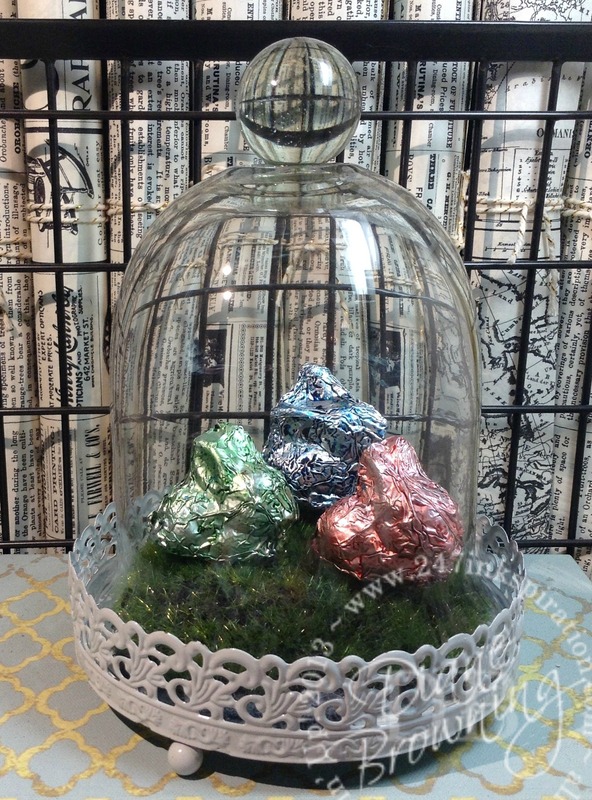 I found this little cloche at one of the craft stores. The grass came in a “sheet” and I just cut out what I needed. Then I made the chocolate covered bunnies. I covered the bunnies in foil and then added our reinkers to each one. I let them dry overnight, but they are still a little damp. I did hot glue them to the grass, but I did not glue down the grass so I can change out the display if I choose. Here’s what the bunnies looked like before I covered and colored them. Awwwwe! So sweet! 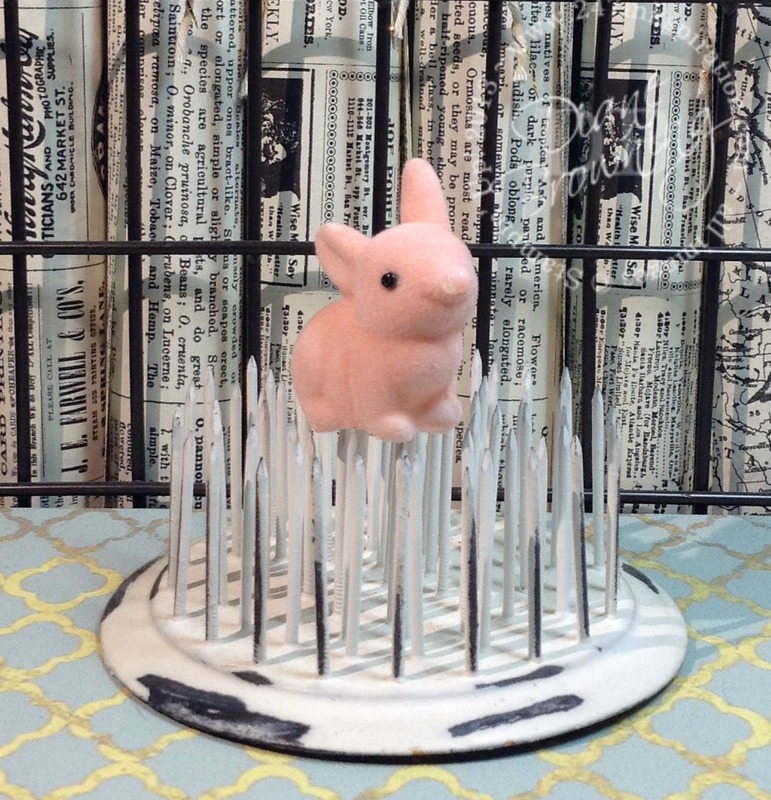 Are you working on Easter projects too? Just a few more days to get things done!